SAN FRANCISCO -- San Francisco Mayor Ed Lee went outside the department to choose the new San Francisco Police Department Chief. 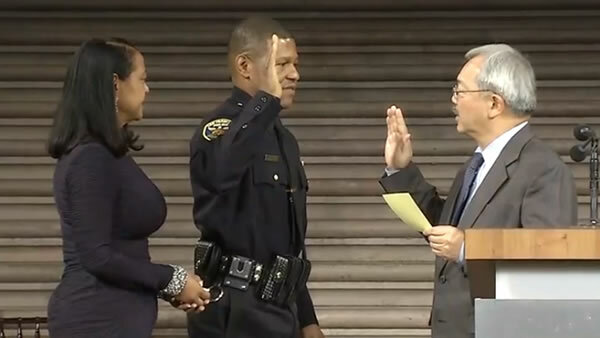 Former Los Angeles Deputy Chief Bill Scott was sworn in as San Francisco's new chief of police at City Hall Monday afternoon. Scott's appointment was announced last month following a search triggered by the resignation last May of Chief Greg Suhr in the wake of several fatal police shootings and scandals centering around racist and homophobic text messages within the department. He takes over a department that is working to implement reforms based on a U.S. Department of Justice report issued in October that found racial disparities in traffic stops and searches, problems in the handling of use of force incidents and a lack of transparency, among other issues. The department also recently finalized a revised use of force policy that has become the subject of litigation with the San Francisco Police Officers Association. The police union has sued to block the policy's bans on shooting at moving vehicles and the use of the carotid restraint, a type of control hold that cuts off the blood flow to a suspect's brain. Mayor Ed Lee had been expected to choose interim Chief Toney Chaplin, who had the backing of the police union, but instead opted to go with a department outsider. Scott, an Alabama native, has served for 27 years with the Los Angeles Police Department, most recently as deputy chief.